Since Rob Bell’s Love Wins was published a few years ago, hell, always a controversial topic, has become extremely controversial. And I can understand the controversy. As an evangelical Christian, I believe in hell, but it is a difficult doctrine to hold. 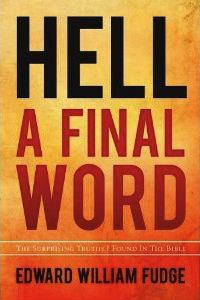 So when I saw that Leafwood Publishing was publishing a new book by Edward William Fudge entitled Hell: A Final Word, I was anxious to read it. I’ve heard of Fudge’s former book, The Fire That Consumes: A Biblical and Historical Study of the Doctrine of Final Punishment. It is one of the main works advancing annihilationism, the view that the unsaved are not eternally punished by God but are annihilated, that is, God causes them to no longer exist. This previous book on hell received attention from many theologians, so this short introduction to Fudge’s position is a welcomed sight. “The Old Testament says nothing about hell” (65). Jesus’s view of hell was that sinners would be everlastingly tormented, a view that arose in the time between the Old Testament and the New Testament. The New Testament writers taught that hell is everlasting torment. “The immortality of the soul requires unending conscious torment unless those in hell are restored to God and join him in heaven” (65). Fudge rejects these Four Pillars. I will summarize his argument against them. First, the Old Testament has a lot to say about the “end of the wicked” (67). The OT has a lot of implications about hell, not the least being its teaching that the wicked will be destroyed. The Second Pillar and the Third Pillar depend upon the interpretation of various New Testament passages, and Fudge’s argues that plenty of passages seem to teach that the unsaved will be destroyed, not that they would be eternally punished. His argument against the Fourth Pillar is that the notion of an immortal soul comes from Greek philosophy, not from the Bible. With these arguments against these four core assumptions of the traditional view, the ground is clear for Fudge to argue for annihilationism. The core of Fudge’s arguments in defense of the annihilationist is to show that the vast majority of the passages concerning God’s punishment for the wicked teach that the wicked will be destroyed, not tortured (eternal punishment) or purified of their evil (universal salvation). Of the passage, he asks what type of fire they describe. “What type of fire?” you might ask. “Isn’t there only one type of fire? The type that burns!” And this is where Fudge’s simple style really helped to put forth the basic outline of this discussion. The debate focuses around three types of fire: a fire that consumes, a fire that torments, and the fire that purifies. These three different functions of fire – destruction, torture, or purification – corresponds to the three positions about the passages about God’s judgment. Either God’s wrath will destroy sinners, eternally torture sinners, or purify sinners (so that all will be saved). For almost every passage that mentions God’s judgment, the clear meaning is that the fire will destroy or consume the sinners. From this, Fudge concludes that the Bible teaches that the fires of hell do not torment for eternity, nor do they simply purify people, but the fires of hell consumes sinners. They will go out of existence. He does discuss the issue at more depth, but he uses this fairly simple argument form for most of the passages he discusses. So Is the Book Worth It? The book is inexpensive and an easy read. So I think it is worth it. One can learn the basics of Fudge’s position from this little book. But I would have preferred more depth. The details of the arguments did not satisfy me. Fudge has already done that in The Fire That Consumes, but I think this book lacks the details and depth to convince the inquisitive layperson, while his scholarly work on the subject would most likely be intimidating to laypeople. So it would be nice to have book that treads the ground between Fudge’s scholarly work and this popularized version of it. Talk about a “seared conscience”. The level of brain-washing among conservative Christians is truly shocking. It nauseates me every time I discuss the concept of Hell with a conservative Christian and must listen to his or her pathetic justifications for why it is just, fair, moral, and even good for a “loving Heavenly Father” to burn alive millions of human beings in his eternal torture pit. The same people who decry Muslim fundamentalist terrorists for burning alive their captives, turn around and justify their own God’s thousands of years old habit of burning alive millions upon millions of people who dared to commit a “thought crime” against him. General X is a brutal warlord. He has slaughtered innocent men, women, and children by the tens of thousands. He has raped and pillaged. He has committed genocide. However, on the day he is to be executed for his crimes against humanity, a Christian pastor comes to his jail cell and preaches the gospel of Jesus Christ to him. The general begins to cry, “I am so sorry for all the horrible things I have done. Please forgive me, Jesus. Please be my Lord and Savior.” Five minutes later he is executed. Immediately upon his death, his soul ascends to heaven where he enjoys eternal happiness, peace, and untold riches with Jesus, the angels, and the other saints. Mrs. Wong is your neighbor. She lives three houses down from you. The children on the block call her the “Nice Cookie Lady” as she is always very kind to them and always has a plate of cookies set out for them. She has been a volunteer in the local homeless shelter for more than 30 years, where she cooks, cleans filthy indigent clothing, and scrubs the toilets and floors…for no monetary compensation. She says she does it because she loves people and enjoys helping the needy. Mrs. Wong has heard the “gospel” story of Jesus many times, however, she prefers to retain her childhood belief system. Mrs. Wong is a Buddhist. Mrs.Wong died last week, and at this very moment, is writhing in horrific agony in the flames of Hell…and she will continue to scream and writhe in horrific agony for all eternity. Now, dear conservative Christian friend: Can you really tell me that the above scenario is just, fair, moral, and good? How can General X commit horrific crimes his entire life and still get into heaven at the last minute simply by a change in belief, but Mrs. Wong is going to be burned alive forever, despite her exemplary life of service and kindness to others, just because she made a mistake in which supernatural belief system to believe? If the Christian concept of Hell is true, then we should all tremble in utter terror before the Christian God. But, to call it just, fair, moral, and good is simply delusional, friend. Let’s be honest and call it what it is: Evil. Hello Gary M. I think you did not read the review of the book being reviewed, or you missed the point. The book being reviewed, argues for the view that the Holy Bible teaches that the fate of the lost is to be destroyed, to cease to exist. At the Great White Throne Judgement, the wicked are judged by Jesus and then sent to the fires of Gehena or Hades or the bottomless pit, where they experience the second death, they cease to exist. Throughout the Bible, one can read the wages of sin is death or perishing, not eternal torment. The author talks in the book, how Greek philosophy and some basic misinterpretations entered Christendom and made the majority interpretation of Hell to be, eternal conscious torment. An example would be, in the New Testament mention is made of “the worm that dieth not”. This is actually quoting an Old Testament book Isaiah, where worms were eating dead bodies, they were not tormenting any living person. Also he mentions in the New Testament where gnashing of teeth are mentioned. Other parts of the New Testament show that the people gnashing their teeth were angry, not being tormented and certainly not being eternally tormented, such as those that were about to stone Stephen in the Book of Acts of the Apostles. I would encourage you to read what the Bible actually says, maybe even look at the book being reviewed or that authors previous book ‘The Fire That Consumes’. You may do well to look up the Rethinking Hell web site. It has blogs and podcasts, sometimes debates. It is hosted by evangelical Christian people who hold to the view of Conditional Immortality, but they have interviews with guests on who present their views that represent all three main views, and variations within theses views, about Hell and the fate of the lost, from an evangelical Christian Biblical point of view.